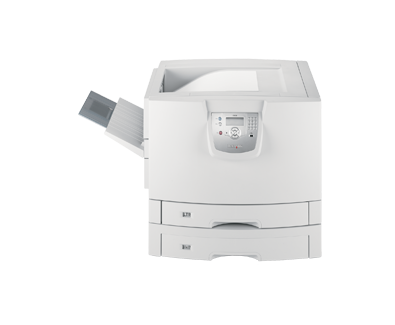 Network-ready with standard automatic duplex, Lexmark’s C920dtn colour laser includes a second input tray, so you can load two paper types or boost your total capacity! Intuitive operator panel with graphical 'Show Me' to assist in keeping your printer up and running and a convenient USB flash drive for easy direct printing of PDF files using the convenient USB Direct interface on the operator panel. Up to 36 ppm in black and 32 ppm in color (up to 19 ppm when printing duplex) to quickly handle short or long run jobs to maximize productivity. 1000 MHz processor with 512MB of standard RAM (maximum of 1GB) quickly drive a quick time to first page as fast as 9.5 seconds in black and 13.5 seconds in color. In network printers with Lexmark MarkNet™ N8000 series print servers, Simple Network Management Protocol (SNMP) v3, Secure Sockets Layer (SSL*), IP Security (IPSec) and 802.1x authentication provide security measures for printer communications and data encryption. For any printer, hard disk data encryption for print job data security and printing restriction. Confidential printing with enhanced personal ID number (up to 10 digits) management including lockout, job expiration, and invalid PIN protection. *This product includes software developed by the OpenSSL Project for use in the OpenSSL Toolkit.